STL import/export for Unity, supporting both ASCII and Binary. An STL importer/exporter for Unity. pb_Stl is the exporter used in ProBuilder to save STL model files. Select a GameObject in the Scene View with a MeshFilter and valid Mesh. In the file menu, Edit > Export > STL (Ascii). View your shiny new STL file. Export and import Binary & ASCII STL files in editor or at runtime. Custom AssetPostProcessor automatically creates usable prefabs from any STL imported to Unity. Option to convert from left to right handed coordinates (on by default, as per STL spec). Automatic merging of multiple selected meshes, including relative transformations. Import models with vertex counts larger than Unity max by automatically splitting into multiple meshes. Swap model axis on import/export. Export as multiple objects or merge (currently always merges). 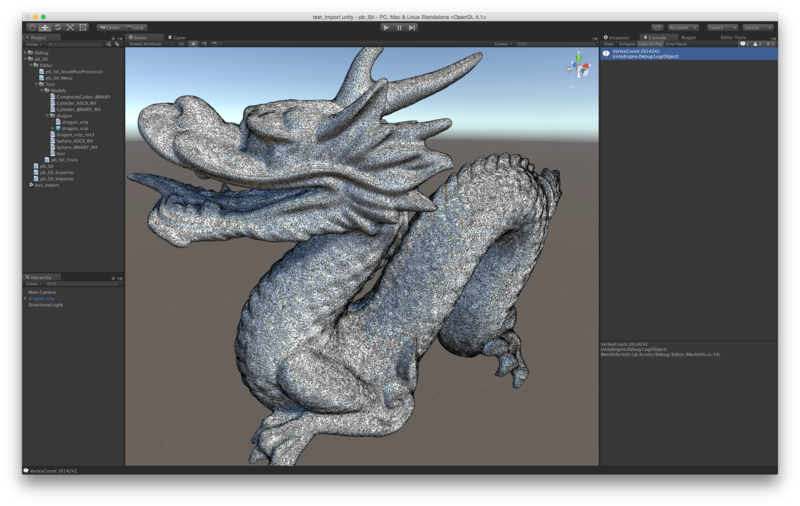 Generate normals on import (with smoothing or no). Unity’s coordinate system is left handed, with Y axis as the vertical. Other 3d modeling programs may have different coordinate systems or axis assignments. pb_Stl exports right handed coordinates by default, but can be modified to retain left handed coordinates. Support for swapping axes is planned. If you would like to submit improvements please include NUnit tests for your changes (and make sure they don’t break any existing tests).